This morning (August 17, 2013) I saw a question on a forum asking for someone to explain what the difference was between level and furled lines. He said he knew that furled lines were tapered but asked what level lines were. He received several answers, but most suggested that furled lines were easier to cast. What I think they should have said is that furled lines are easier to cast if your form is bad. With good form, level lines are very easy to cast. What is more, they are easier to actually catch fish with! Level lines are lighter than furled lines* and being lighter are easier to hold off the water's surface. If your line is in the air rather than in the water, you will get much less drag, much better presentations and many more strikes. If you have a light line in the air rather than a heavy line caught in the water, it will register those strikes much more easily. The combination of more strikes and better strike detection is a pretty solid advantage to level lines in my opinion. It may take a little longer to learn to cast a level line. You will have to learn good form. However, time spent learning good form will pay off handsomely. Learning to cast properly will take minutes longer, not weeks longer, and with better form and a lighter line you will be rewarded with hundreds if not thousands more fish. *Blanket statement alert! If you make your own furled lines, you can make one lighter than you can buy. I do not believe you can buy one anywhere that is as light as a readily available size 3 level line. 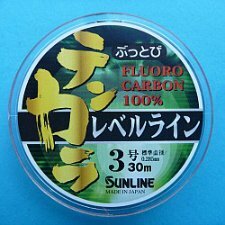 If you want the advantages that light lines bring to tenkara, fish level lines from day 1.